Sen. Art Linares (at podium) on Sept. 1 joined with Rep. Devin Carney (seated in second row) and area commuters attended a public hearing at Old Saybrook Town Hall to testify against the State Department of Transportation’s proposed fare hikes on Connecticut rail commuters. “Rep. 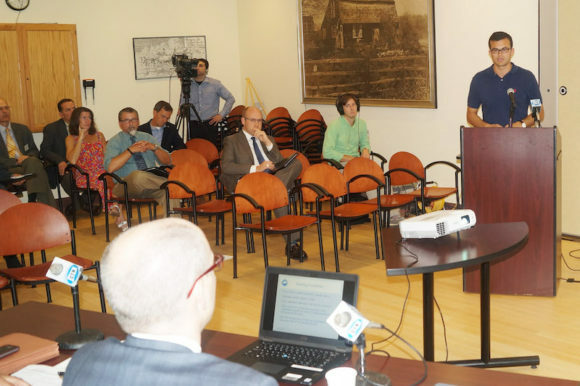 Carney, area commuters and I attended the Sept. 1 fare hike public hearing at Old Saybrook Town Hall to send a clear message,” Sen. Linares said. “That message was that the overall cost of living in Connecticut continues to grow and grow. From state tax hikes to health care expenses, costs keep going up year after year. I hear this every day from people in the communities I represent. Sen. Linares (Art.Linares@cga.ct.gov) represents Chester, Clinton, Colchester, Deep River, East Haddam, East Hampton, Essex, Haddam, Lyme, Old Saybrook, Portland, and Westbrook. He can be reached at 800 842-1421 or on the web at www.SenatorLinares.com. Rep. Carney (Devin.Carney@housegop.ct.gov) represents Lyme, Old Lyme, Old Saybrook and Westbrook. He can be reached at 800 842 1423 or on the web at www.RepCarney.com.